Many staff members, engineers, and technicians here at Hartridge have an extensive vehicle workshop background. These many years of experience in the industry prove invaluable across all areas of the business and our understanding and passion flows directly back into the Hartridge products. Why ask about workshop challenges in particular? Just within Hartridge alone, our colleagues’ experiences of vehicle workshops are incredibly varied. Most workshops are completely different thanks to the types of vehicles they work with, and the types of customer they look after. This question recognises that variety within the industry. This question also recognises that whatever their biggest challenge it will impact on all areas of the business and shape how they work. At Hartridge we believe that the more we understand these challenges, the better a solution we can develop. What were the different options? Our polls on our website and on twitter have a few different options. We asked if correct diagnosis was the biggest challenge. Vehicle diagnosis is not always straight forward like some people might imagine. Sometimes reaching the correct diagnosis requires more than simply plugging into the OBD port and getting the answer immediately, and sometimes it can take more than one visit to the workshop. While this can be unavoidable, the more that the diagnosis process can be improved the better for the customer. We also asked about technician training. 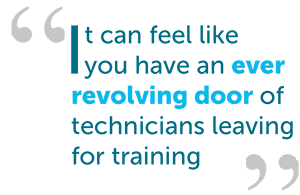 The need to train technicians to the latest industry standards on constantly updating technology can feel like you have an ever revolving door of technicians leaving to go to the latest training courses. Therefore we understand that keeping the training up to date while not being able to send everyone is a tough balance to achieve in the business. Productivity and efficiency often mean something slightly different to a workshop than to everyone else. Often the workshop knows what types of tasks suit which technician and can play to their strengths and improve the productivity and efficiency of their workload. Weighing up the need for a high quality repair and the time taken to do it is a tough balancing act. 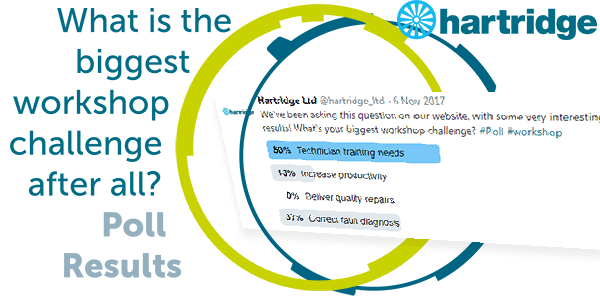 Technician training needs were revealed to be the biggest challenge and were a clear winner on both our twitter and on hartridge.com. 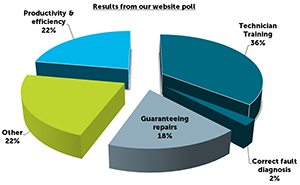 35.7% of people on our website told us that training needs were their biggest challenge, followed closely by workshop productivity with 22.2% of the vote, and also trailed by ‘guaranteeing the repair’ at 17.7%. So why does this matter to Hartridge? It matters because if it is that workshop’s biggest challenge it will be their top priority and constantly look for the best solutions. While technicians join the queue for training it does mean there may be differing levels of training and knowledge within a workshop at any one time. Hartridge benefits the workshop by making sure we keep building absolute ease of use into all our machines. We already achieve this in a number of ways on the Sabre CRi Master and will be in the following new generation of machine. The Sabre CRi Master has many features built into our intuitive programming such as embedding photos & step-by-step guides in the program for setting up the tooling needed. We’ve also made it extremely simple to find the test plan you need for the injector you have without having to know all the test plans. By bespoke designing the icons and buttons for the interface we have made it fast and straight forward to understand the functions and measurements. By keeping our finger on the pulse of the workshop we can stay dedicated to designing our products with the workshop’s needs in mind.